UPDATED: 8:45 a.m. Wednesday – the missing teen has been found safe, according to family. FRAMINGHAM – A Framingham teen, 14, has not been seen since Thursday, August 16. The National Center for Exploited and Missing Children issued an alert for the teen. 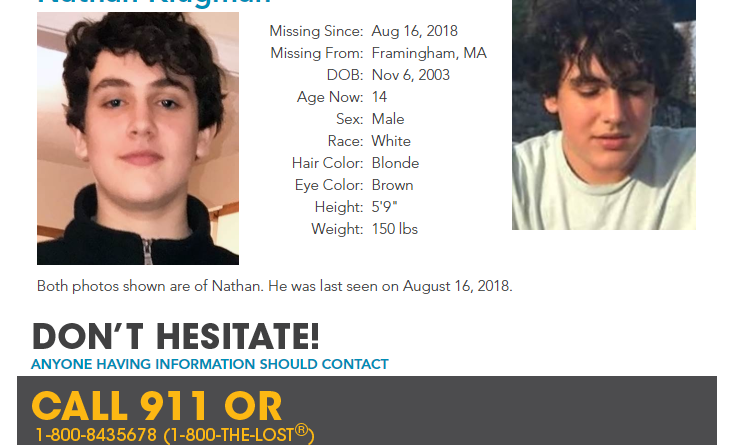 Nathan Klugman, 14, was last seen in Framingham on August 16. He is 6-feet, 3-inches tall, and 150 pounds. He also has brown hair. If you have seen him, please call the Framingham Police.